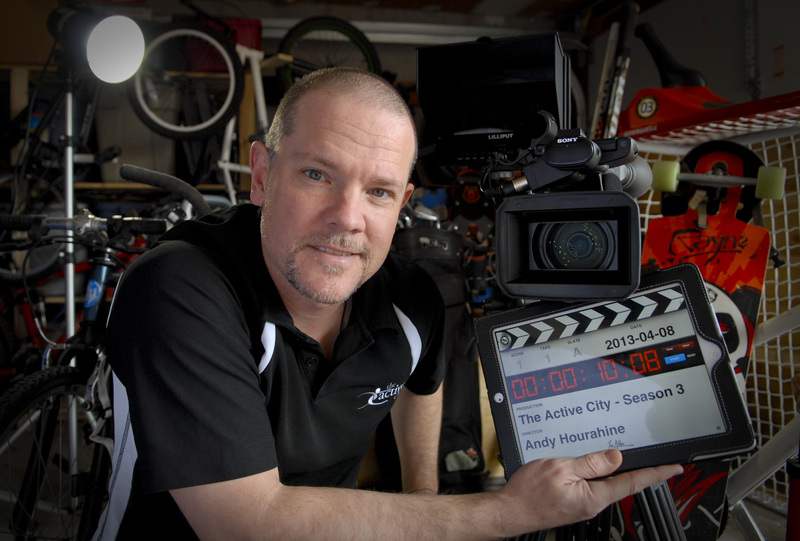 Active advocate and filmmaker, Andy Hourahine, wasn’t ready to call a wrap on the locally produced television program, The Active City, just yet. The program, which first aired on Rogers Television in 2010, focuses on sharing the stories and successes on those who live an active lifestyle. Hourahine has showcased everything from surfing the Great Lakes to 24 Hour mountain biking all in hopes it will reinforce healthy behavior and encourage others to join in. That’s why he was so reluctant to let it go. “We finished production on Season 2 in January and had no funding secured to continue the program even though I felt that there were still so many worthy stories to share and good work left to be done,” explains Hourahine. Thanks to a grant from the Ontario Trillium Foundation, Active Andy, as he is known in the community will get his wish. The program will play a key role in a multi-media platform that will continue to educate the community about the joys and benefits of physical activity, while offering tangible ways to get involved. Hourahine has been on a local, active mission since 1999 and, together with Active Cambridge, has already gained plenty of notoriety for our local fitness efforts including recognition from the CBC as one of the most active communities in Canada. Charles Wechsler, head of programming at Rogers TV, is excited about having the show returning to his line up. During the 2012 calendar year, Active City aired a total of 366 times in Waterloo Region. Almost a third of these airings were in prime time. In addition, the series had a similar numbers of airings in our three other nearby markets (Brantford, Guelph and Stratford), for a combined total of 1,472 airings. That’s almost 740 hours of health promotion going out to almost 200,000 households in those four markets. The new season will have some returning people, places, and pursuits but with a new mission, say Hourahine. The goal for season three is to follow the story of everyday people getting off the couch and embarking new adventures in fitness by connecting with activities that are true to their latent, active personalities. Appreciation to my father who told me on the topic of this web site, this blog is truly amazing.